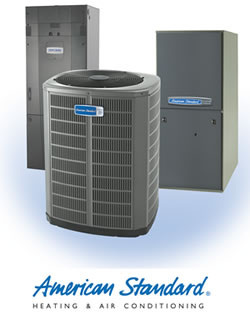 American Standard Heating and Cooling "Take control of your home.Until the day someone invents a device that can control the weather, you’re at the mercy of your local climate with all of its storms, winds, and hot and cold flashes. But just because you can’t turn down the sun on a hot summer day doesn’t mean you’re not in control of your home. We’ve spent more than 130 years increasing and perfecting the control you have over the climate in your home. No matter what’s going on outside, it’ll be exactly how you want it inside." Inexpensive pleated 1" filter (typically a 3 pack is sold for $8). "The best choice for allergy sufferers. 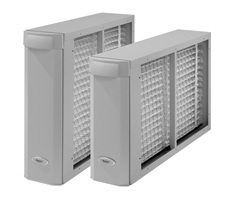 Aprilaire 2210 and 2410 Whole-House Media Air Cleaners deliver the most efficient, cost-effective air cleaning for your home. Equipped with patented filtering media that can give you exceptionally clean air throughout your home - at a very affordable price." 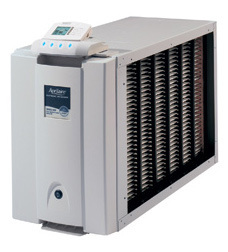 "The Aprilaire Model 5000 Whole-Home Electronic Air Cleaner has been rated #1 three years running by a leading products ratings magazine for some very good reasons: It electronically charges particles and traps them like a magnet better than any other air cleaner - using 72 square feet of Aprilaire-branded filtering media. The Model 5000 is tried, true, and tested - delivering the highest efficiency possible." Independent lab compares top electronic air cleaners and their performance over time below. "Every Aprilaire product provides these important key benefits for your family and home. An Aprilaire Whole-House Humidifier can reduce the chance of upper respiratory problems. “Humidity reduces the incidence of respiratory infections and speeds recovery from the common cold.”—William J. Hitschler, MD, Archives of Otolaryngology. When the air in your home becomes too dry, your body is robbed of precious moisture, leaving you and your family with dry, itchy skin, and dry nose and throat symptoms. An Aprilaire Whole-House Humidifier can help alleviate all of these uncomfortable symptoms and more. Dry air pulls moisture from walls and hardwood floors which leads to damaging, unsightly cracks. Valuable furniture, artwork and electronics are also subject to the adverse effects of dry air. 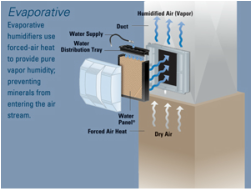 An Aprilaire Whole-House Humidifier can help protect your home and its contents by supplying the correct amount of moisture to your home’s air. Most homeowners turn up the thermostat because they feel cold. An Aprilaire Whole-House Humidifier allows you to feel warmer at lower thermostat settings, saving up to 4% on your heating bill for every degree you lower your thermostat, according to the EPA." Powered Humidifier - Starting at $750 Installed with a new quarter turn water ball valve installed on the hot water piping. "Air Purification is the process by which we remove, destroy or render harmless bio-aerosols and volatile organic compounds in the air we breathe. 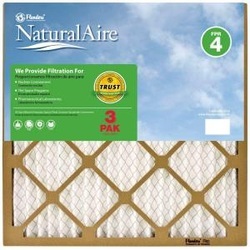 Filters as noted, are used mostly to remove inert particulate from the air stream. Unfortunately, this accounts for on average only 35% of our indoor air quality problem. Microscopic gases and bio-aerosols are the real danger and can only addressed by other means. Air purification is the single most important defense in reducing harmful contaminants within our homes and places of work, especially in the absence of any outside air exchange. " biological agents than the outdoors. Some may create bad odors, others can be extremely harmful to your health." 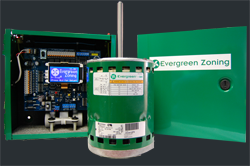 Evergreen direct replacement ECM variable speed motor information: "Evergreen IM is high-efficiency ECM replacement motor that is designed to replace factory PSC blower motors in HVAC systems. That means you can now offer your customers the comfort and efficiency of ECM in an easy-to-install replacement motor. 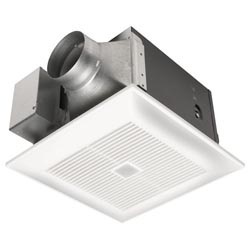 Built from the same trusted, field-proven ECM technology that is found in millions of OEM systems nationwide, Evergreen uses up to 25% fewer watts in operating mode and up to 74% fewer Watts than a PSC motor in constant fan." "Like conventional HVAC systems, the Fujitsu Halcyon system locates the noisy compressor and condenser outside the house. 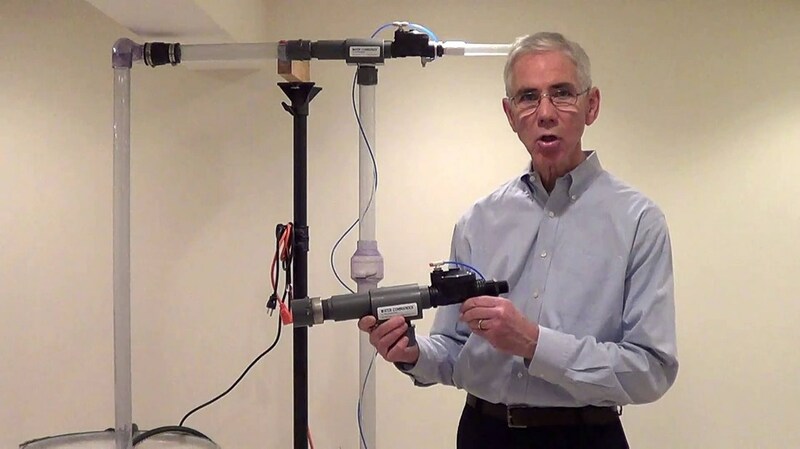 But Halcyon systems eliminate the need for a basement- or attic-located evaporator unit and bulky ductwork by using thin copper tubing that pumps refrigerant directly to discreet wall mounted blowers inside. Even more remarkable, this same unit works in reverse in winter, absorbing heat from the outside air and moving it indoors to heat your home. The result? Efficient cooling and heating for year-round, whole-house comfort in most climates. Available in numerous mix-and-match capacities and configurations, there's a Halcyon mini-split system for even the most difficult to heat and cool areas. Flexible, Remote Control Cooling Because each room has its own handler, you can create up to four zones with a timer and optional wired remote that puts you in temperature control and allows you to meet the varying comfort needs of different spaces." 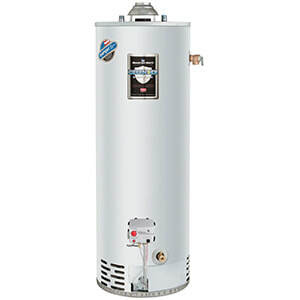 Gas Bradford White and AO Smith offer a large selection of gas water heater models from our innovative high efficiency designs to our standard energy-efficient units for both natural gas and propane applications. 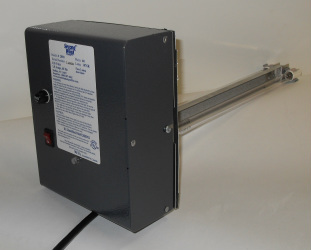 Models are available in 6 and 10-year warranties and a variety of gallon capacities. 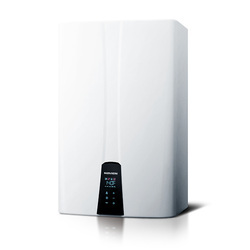 Electric Bradford White and AO Smith offer a complete line of electric water heaters, from the exciting new energy-efficient electric heat pump units to your standard electric (heating element) hot water heaters.